Your door says a lot about what you value. That’s why LARSON Storm Doors are built to protect what matters most. Sierra Remodeling now offers storm doors from the largest manufacturer of storm doors and specialty doors in the United States. Enhance your home’s security while beautifying your entries and hire Sierra Remodeling to install Larson SecureElegance® security storm doors! The Screen Away® retractable screen converts your storm door to a screen door, instantly. When a clear view is desired, the screen discreetly hides in a cassette at the top of the door. Look at storm doors in a new way. Today you can get the best of both worlds, light and ventilation. Larson invented Screen Away, the storm door with the disappearing screen. This revolutionary screen and window system give you the beauty of a full view storm door with ventilation at your fingertips. The Screen Away system makes it all possible. Why not include Larson storm doors when purchasing new exterior doors from Sierra Remodeling, your one-stop shop for all your home remodeling needs. The first storm door with a hidden closer yields a beautiful view inside and out. The Click&Hold™ design hides inside the door and features a hold-open catch & release. This closer ensures the door will be held in place securely until pulled shut. These premier doors feature Larson’s thickest, maintenance-free aluminum frame (1-7/8 inches) and an overlapping edge with dual weatherstripping for the tightest seal. Sierra Remodeling believes it’s the little things and innovations that move the building industry forward. Have you ever tried to open your storm door with a bag full of groceries? Not pretty. Larson Click&Hold™ yes! As pet lovers ourselves, we understand the struggle of functional durability and style for your home. 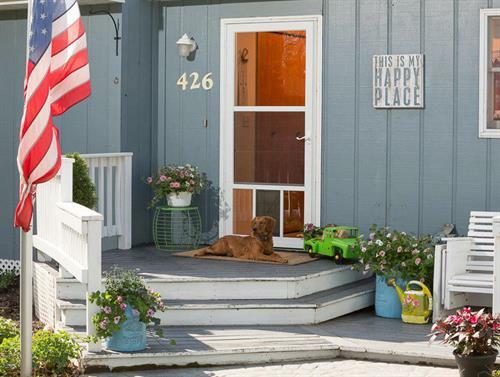 With Fido in mind, we are proud to introduce the first Petview door from Larson. Not only do they let in the natural light to enhance your entry way, but they are built tough enough to stand up to your active pets. These full glass doors come with a 10-inch by 17-inch pet door built-in and a slide-in cover to close the opening when needed. I would like to take this opportunity to commend your employees, Mike and Matt for the superb job they performed in remodeling our two bathrooms. Their attention to detail, and care in protecting our floors, the clean up, and the efficiency with which they removed the old material made the demolition surprisingly tolerable. The professionalism with which they performed all phases of the job was exceptional. The quality of their work on the re-bath material is much appreciated and admired. 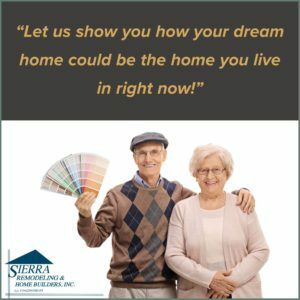 We will gladly use Sierra Remodeling services again, and will recommend you to our friends. Again, thanks for a job well done. ― Kermit and Julia R.